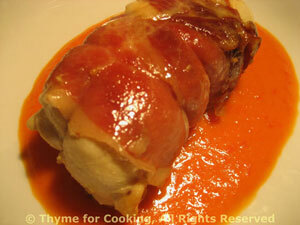 Thyme for Cooking Menus: Prosciutto Wrapped Chicken Breasts, easy recipes. Fava or broad beans are a sign of spring that I almost forgot about... They are so fleeting here. They're a bit of work (like fresh peas) to prepare so I use them in risottos or pastas, rather than on their own. You can substitute edamame (fresh soy beans) if you like - same color, similar taste and texture. Another classic Italian dish for spring. It would normally be served as a first course (as are all pasta and rice dishes in Italy) but I like it as creamy side dish. Fava beans are only with us a short time in the spring. Trim and thickly slice green garlic, using as much green as possible. 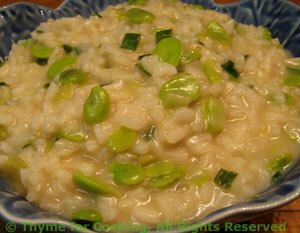 In medium sauce pan heat butter; add green garlic, rice and sauté, stirring, for 2 - 3 minutes until rice has white center. When the rice has almost absorbed the stock add another 1/4 cup and stir. Add the fava beans or edamame with the next 1/4 cup of stock. Continue adding stock, 1/4 cup at a time, and stirring. Before the last 1/4 cup is added taste a few kernels of rice. They should be just 'al dente' - slightly resistant to the tooth but fully cooked. You may not need the last 1/4 cup. If more stock is needed add it 1/8 cup at a time and waiting until almost completely absorbed. At this point risotto will be thick but not stiff - it will not hold it's shape on a plate. Spoon into a bowl and serve immediately. Peel fava beans: It's a bit like peas. Break open the pod and take the beans out. Don't bother with any really tiny ones. Blanch in rapidly boiling water for 2 minutes. Drain and put into cold water. After blanching they will have a whitish outer shell. Just squeeze lightly and the inner, bright green bean will pop out. It may split in half... that's okay.